Take on the great outdoors with the Leatherman Signal Multi-Tool. It features an array of functional tools you'd expect to see, and all of them can be opened and used single-handed for ease of use and convenience. The commonly seen tools are complemented by more preparedness/survival-minded tools like a sharpener for maintaining your knife edge in the field, a ferro rod for fire starting, and an emergency whistle. 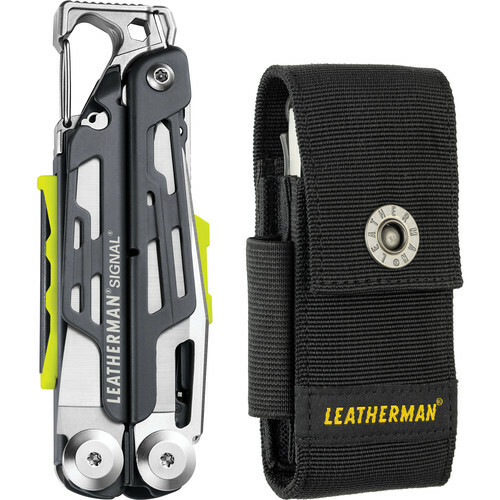 The tool's knife and saw blades can be opened from the outside without having to open the tool's handles so it works more like a conventional pocket knife while providing a beefier handle while you're using it. For additional safety all the tools lock in place so they won't accidentally close while in use. This version of the Signal is offered here complete and ready to go in clamshell packaging.